This book will here forth be known as the book that saved us all. While we collectively fall into the depths of action-packed plot overdose and agenda-infused propaganda, along comes a book whose plot is propelled by the strings of its deep-seated character development and captivating discourse. Me Before You is not a complicated story. Will, a proud man in the depths of self-loathing and hopelessness, confined to a wheelchair and at the mercy of others, employs and befriends a spirited young woman, Louisa, set on changing his dismal perspective and proving to him the value of a life well-lived. 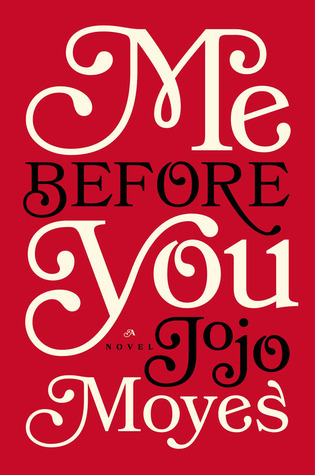 No, it is not a complicated story, but what Jojo Moyes tackles here, is rooted in complications and contradictions, yet she handles it with grace and subtle believability. Told through a tone spliced with humor and humanity, Moyes brings character development to a new level. No longer are flat characters being fabricated by writers to be seen as only they intend them to be seen, but they are independent creatures at the disposal of the on-lookers and voyeurs, otherwise known as readers. We don't read about Lou and Will; we meet them, get to know them, feel angry at them, resent them, love them. Moyes weaves the story around the characters rather than weave the characters into the story. The strong character development is what makes the plot work it's magic. It is quite a clever manipulation, really. Without sincere empathy, the agenda would taint the reader's emotional reaction. We don't cry over the pain of a man, we cry for the pain of Will. With each turning page, she pulls us in, mercilessly, subjecting us to an attachment that works by her own agenda. For the purpose of this story, it is a brilliant technique. Jojo Moyes is a gem in her ability to transcribe relatable characters in a context that is relevant. There is topic being denied by a social conscious at play here that [she has convinced me] needs to be addressed. Moyes says it quite clearly in these 369 pages; the issue of assisted suicide is not easily understood nor easily determined but easily overlooked. I love, love your new look! I just saw this book in my library this week and I thought about picking it up and now I will. Thanks! Yes, yes, yes, absolutely yes. This book is one of the best I've read this year. Will and Louisa are some of my favorite characters. Such a heartbreaking, but hopeful book.